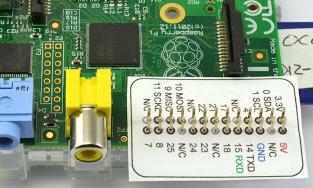 The Raspberry Pi has many GPIO (general purpose input output) pins which can be used to detect (digital) inputs or to control external outputs. The simplest project to get you started using GPIO with Raspberry Pi is to get an LED to flash on and off. In this article we will show you how to get everything you need installed and to get an LED flashing at your command (with minimal background information so that the key steps are not swamped with details of the Linux operating system, programming in Python, electric circuits, LEDs, and so on). wiringPi2 is a software library designed to make it easy (relatively!) 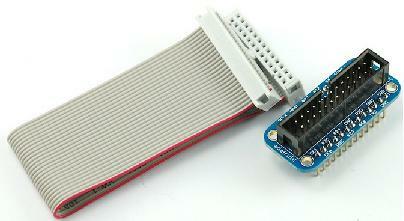 to interface Raspberry Pi with external hardware. Follow our instructions to SSH into your Raspberry Pi: Connecting to Raspberry Pi from PC via SSH and after you login, you should have a terminal window with the prompt pi@raspberrypi ~ $ on your PC. Now, click here to visit an external link which explains very clearly how to Install WiringPi2 for Python on the Raspberry Pi. With that installed you are ready to continue. The wire from GPIO 17 should connect to one leg of a 1K resistor, and the other leg of the 1K resistor to the positive (long) leg of the LED. The negative (short) leg of the LED should then connect to the wire which is connected to the GPIO ground pin. 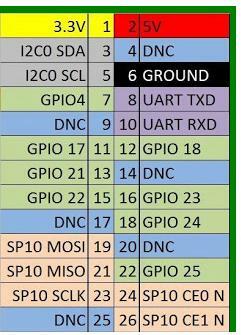 Now all we have left to do is write a Python script to control the output of GPIO 17. When that output is high, the LED will be on, and when it is low, the LED will be off. Since we are using the command line interface on the Raspberry Pi via SSH, we use the text editor ‘nano‘ (click here for the Beginner’s Guide to Nano). At the command prompt type nano flashingled.py. This opens nano and creates a Python file (note the .py file extension) called flashingled.py. Press Ctrl-X to save the file and return to the command line. To run your script enter the command sudo python flashingled.py, and if you have typed in the script above correctly, the LED connected to your Raspberry Pi will flash five times. While this script is running, you cannot do anything with your Raspberry Pi; it will wait for the script to run to completion. If instead you would like the script to run as a background process so that you can continue to interact with your Pi while the script is running, use the command sudo python flashingled.py & (note the ampersand ‘ &’ added to the end of the command). To make the LED flash say 100 times, change the line for i in range(0,5) to for i in range(0,100). The time.sleep(0.5) command makes the script wait for 0.5 seconds. Change the value 0.5 seconds to a longer or shorter duration – e.g. time.sleep(10) to keep the LED on (or off) for 10 seconds each time. 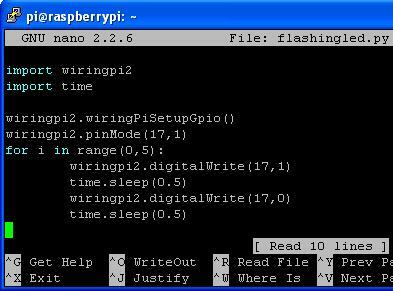 The command wiringpi2.digitalWrite(17,1) tells the Pi to turn on (1) the output of GPIO 17, and wiringpi2.digitalWrite(17,0) tells the Pi to turn off (0) the output of GPIO 17. If you had connected the LED to GPIO 21 then the ’17’ would simply be changed to a ’21’.